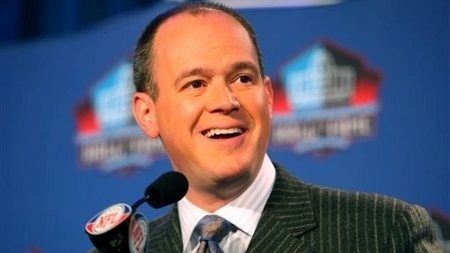 Rich Eisen is becoming one of the hardest working men in show business. In addition to his NFL Network hosting duties, Eisen launched a new daily talk show on DirecTV’s Audience Network today that also appears on NFL Now. Currently, The Rich Eisen Show follows The Dan Patrick Show on Audience Network. Starting next month it’ll gain national distribution on Fox Sports Radio. Awful Announcing has learned that The Rich Eisen Show will launch on Fox Sports Radio networks beginning November 3rd and fill its 12-3 PM ET timeslot. It’s a natural progression for Eisen as he will now follow Patrick on both television and radio. With the addition of Eisen to its daily lineup, The Jay Mohr Show will now air from 3-6 PM ET on Fox Sports Radio. The former SportsCenter anchor has been the face of NFL Network for over a decade since its launch. Recently, Eisen has seen his personal footprint grow with a successful podcast that has garnered 16 million downloads over its lifespan and his new daily talk show that has grown out of it. Much like the podcast that has featured interview subjects from the sports and entertainment world, Eisen’s daily Audience Network/Fox Sports Radio simulcast promises to follow the same format. Monday’s episode featured Patrick as well as Paul Rudd and Breaking Bad creator Vince Gilligan among his first guests.